I am a retired ophthalmologist who has had a love affair with Pinot Noir for nearly forty years. 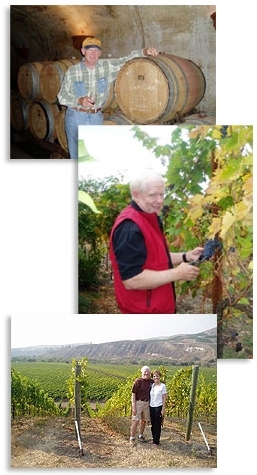 When I retired in 2001, I decided to devote my energies to writing the PinotFile, an online newsletter that was the first wine publication exclusively devoted to Pinot Noir. My wine epiphany occurred in 1970 when a doctor-friend gave me a bottle of Burgundy. I drank it with my first love, which made the experience especially memorable. When I finally finished my medical training, and had enough money to buy fine wine, I began to indulge my interest. I dabbled in many varietals, but it was Pinot Noir that aroused the most affection in my cerebral pleasure center. Fortunately, my burgeoning interest in Pinot Noir coincided in the mid-eighties with the emergence of California and Oregon Pinot Noir as winegrowers began to figure out that Pinot Noir loved cooler climates, welcomed gentle handling, and needed kid-glove handling in the winemaking process. I figured out early on that Pinot Noir was the greatest food wine on the planet. Loving gourmet delights, Pinot Noir was the natural partner for foods from the sea (salmon, ahi), the air (quail), the water (duck) and the earth (venison). Pinot Noir is made for drinking with food and when you have the perfect match, the experience can bring you to your knees! Seductive, elegant, and earthy, Pinot Noir unites friends, food and good time into a glorious dining experience. I taste and drink Pinot Noir daily, I read about Pinot Noir constantly through all of the available sources on wine, and I visit Pinot Noir producing wine regions frequently. 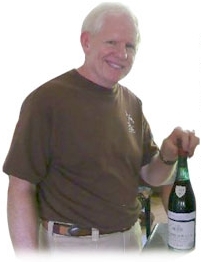 I also lead wine tours, organize wine tastings and wine dinners, participate as a judge in wine competitions, and correspond on Pinot Noir for the most popular wine podcast on the internet, Grape Radio. Additionally, I am involved in Grape Vision, a video-driven offspring of Grape Radio that has won a James Beard Award for a video on the Russian River Valley. I also write a wine blog, "The Wine Dudes," for Orange County's lifestyle magazine, Orange Coast Magazine. Today, I have an enthusiastic reader base throughout the world. This is in part because I prefer to give some helpful comments that reveal the style and spirit of a wine that lead you on the path of discovery, but do not tell you what to drink, and in part because I do not take wine or myself too seriously as reflected in the humorous slant to my writing and reporting.